Looking for things to do in the Capital Region this weekend? We’ve rounded up our top picks for holiday themed events in Albany and Saratoga. Check it out! The 19th Annual Price Chopper Capital Holiday Lights in the Park will be open all weekend! 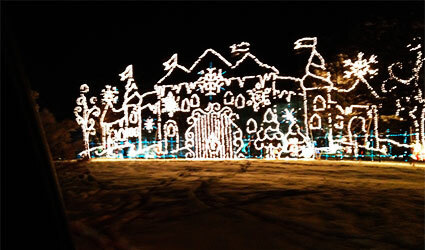 Take a drive through and check out over 125 illuminated displays in historic Washington Park. CBS 6 Melodies of Christmas will have shows on Friday, Saturday and Sunday at Proctors. This holiday extravaganza will feature the Empire State Youth Orchestra and Youth Chorale, Grand Central Station and the Northeast Ballet! It’s A Wonderful Life will be screened at the Palace Theatre on Friday evening. This holiday classic is based on the short story “The Greatest Gift,” don’t miss it! Just because the Last Run 5K is sold out doesn’t mean you have to miss out on the fun! Cheer on the runners as they trot through Washington Park and enjoy the fireworks show at 4:45 PM! Home Made Theater will perform their production of Miracle on 34th Street on Friday evening at the Spa Little Theater. Don’t miss this holiday classic! The 4th Annual Santacon will also take place on Saturday! Get in the holiday spirit and join your fellow Santas while parading through downtown Saratoga’s popular bars and pubs. Remember to bring at least four non-perishable food items to donate! Caffe Lena will host their Holiday Folk Show on Sunday afternoon. It’s a celebration of the season complete with swanky décor, audience participation and a ton of songs! If you’re looking for more weekend fun, check out the full list of events happening in the Capital Region! Next Article #GiveAwayYourHouseGuests This Holiday Season!